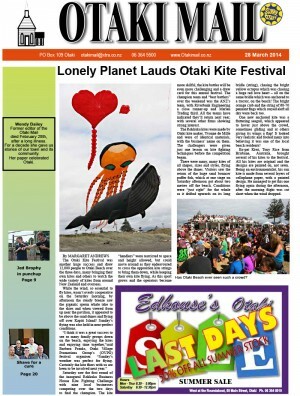 The Otaki Mail is a monthly community tabloid newspaper delivered to every household in the urban area of Otaki. It is also delivered to the rural area from Manakau, to the north of Otaki, to Te Horo in the south with over 1,000 copies being delivered to the rural community. It is very community based tending to look more deeply into issues rather than trying to scoop with the news. 1,100 to rural deliveries from Te Horo in the south to Manakau in the north. The original Otaki Mail was first published around 1892 under the name of the West Coast Mail before in 1895 changing to the Otaki Mail. In the 1940’s the Otaki Mail was merged into the Levin Chronicle. In 1991 the Otaki Mail was relaunched by Annabel McLaren as a monthly community paper commited to informing the people of Otaki and the surrounding areas. In 2002 the paper was bought by Alan and Wendy Bailey who continued the commitment to the Otaki community until January 2014 when they passed the baton on to Ann and Lloyd Chapman, now the current owners, for safe keeping.